Christian tattoos are the ultimate symbols of your faith and belief because anyone looking at them will know what they symbolize. However, in these modern times, they are not a preserve for Christians because many modern design variations make them look fashionable and hence perfect for any person that wants something that looks trendy. What Do Christian Totems Mean? Where Should You Place Them? There has always been a debate on whether it is right for a Christian to have a tattoo or not with some people even quoting biblical verses that prohibit them. However, historical evidence points to the fact that even the earliest Christian had some form of body markings. About two centuries ago when the religion was in its infant days, some followers of the religion would carve out a cross on their forehead or any other part of the body as a sign of faith in Jesus and all his teachings. Even in the days of Christian persecution, some monks would have images on their body to symbolize their faith and also as a way of defying the authorities. Although the early totems look nothing like what we have today, they still qualify as a tattoo and so it is right to say that this type of body art has been around for at least two thousand years. 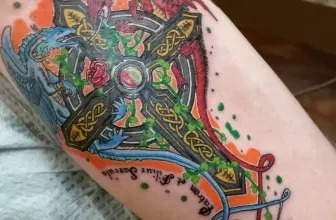 In the world of today people are slowly accepting tattoos as a form of art, and so even people of deep Christian faith get them, and this is what has brought about the countless designs that are now available globally. Christian tattoos have various meanings, but the main one is faith. Having one of these tattoos can show that you are a Christian, and you believe in Jesus Christ and his teachings. They are a modern way of expressing your faith and as a permanent reminder to live according to the teachings of the Bible. They can also be a symbol of hope and salvation because the two are among the main pillars of the religion. Your cross or bible tattoo can symbolize that despite what you are going through in life you are hopeful that God will see you through it. Some of these tattoos can also be a prayer and this more so if they involve drawing a biblical verse or the Bible. You might not always have the time to pray but having a tattoo means that you are praying in your heart. Apart from praying, you can also use the totem for encouraging others because this is what Christianity does. Some people will also have the tattoos as a sign of commitment to someone or something, and so it does not always have to show your faith in God. Other common meanings that people may associate with these totems include perseverance, love, mercy, optimism and protection. A tattoo of Jesus on the cross is perfect for symbolizing perseverance and love because despite all he went through he still came out strong and he did it all due to his love for humanity. Catholics believe that having the tattoo of a rosary or the image of Mary inked on their body will protect them from the evils of this world. Religious tattoos are very versatile because there are almost endless things that you can draw. 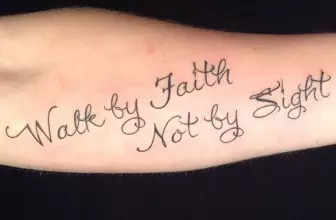 Whether you want to profess your faith or something cool that will make you look stylish, there are still many Christian tattoos that you can have. The following five are the most widespread and also what most people seem to prefer. The cross is one of the most popular tattoos and not just as a Christian body marking but also as part of other conventional body markings. It has its origins from the story of Jesus’ crucifixion, and it has been a very popular image for thousands of years. In the modern times, people draw it in different ways to make it look stylish, and this includes giving it different patterns and colors, adjusting its shape and also combining it with other symbols. Praying hands are a symbol of hope for Christians, and this is why people will have it inked somewhere on their body. It is also a very versatile tattoo that you can draw in different ways. You can have the hands holding a rosary or a bible and even combine it with a biblical verse or quote. A rosary is a component of prayer for Catholic Christians, and it is one of the most sacred things in this religion. In fact, Catholics believe that it comes from Mary, the mother of Jesus. The rosary makes a beautiful tattoo image, and this is more so given the fact that you can draw the beads in different designs and colors to brighten your totem. Apart from this, there is an option of combining it with other Christian symbols to give it a deep meaning. Angels are common tattoo images, but they also have their origins from Christianity. Having one or a couple of them on your body also makes a beautiful Christian totem. No one knows for sure how Jesus or Mary his mother looked like, but there are some images that people across the world have come to associate with the two. And so having these standard images on your body also makes excellent tattoos. This variation is perfect for people who prefer to have words instead of complicated images inked on their body. For this symbol type, you only need to pick your favorite quote from the bible and have it inked on your body with a font or calligraphy of your choice. You can have your Christian tattoo anywhere you find it most symbolic or where you feel most comfortable tattooing. Some Christians will prefer to have their praying hands on the chest close to their heart to symbolize the important role that religion plays in their life. For others, the back is a perfect place to have the same tattoo because of the availability of space. 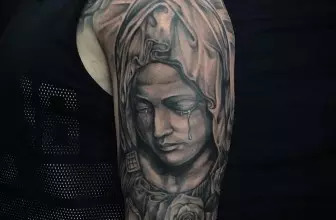 The image of Mary, Jesus or an angel looks fantastic on the upper arm, and this is more so if you give it some beautiful colors or draw it in 3D. Your hands and legs can also make perfect placement areas for Bible verses while the wrist and fingers are ideal for small crosses. Christian tattoos are very stylish, and they come in many types and designs, and so they are not just dull images that people use to show their faith. Anyone can have these tattoos, and this is regardless of whether they are Christians or not. These tattoos are an excellent choice for anyone looking for an attractive body marking with deep symbolism.